Welcome, Mary Ann, our new Development Director! Social Justice Fund is excited to welcome our new Development Director, Mary Ann Midori Goto. At the same time, we extend a grateful goodbye to Kylie Gursky as she moves to Kansas City, MO to be with her partner. 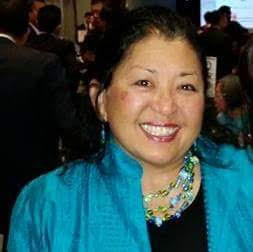 Mary Ann Midori Goto has over 23 years of experience in fund development in organizations like Wing Luke Asian Museum, Town Hall Seattle, and Habitat for Humanity, and in volunteer leadership roles with the Japanese American Citizens League, Interim CDA, and Asian Americans and Pacific Islanders in Philanthropy. Mary Ann began growing her roots in the Pacific Northwest 40 years ago and enjoys zumba, golf, regional theatre, and discovering new restaurants. Her background in social work and counseling have always been a foundation for her commitment to strive for a just and humane world. We are thrilled to have Mary Ann’s experience and enthusiasm lead Social Justice Fund’s development department. She will continue to build our organization, strengthening our ability to be a sustainable resource for the Northwest. She is looking forward to getting to know you soon! Contact Mary Ann at maryann@socialjusticefund.org. Kylie Gursky has grown with, and contributed immeasurably to, Social Justice Fund over the last six years. As a member of our first Giving Project in 2010, Kylie realized she’d found a way to make an impact on the issues she cared about. Kylie Gursky and her partner, Sarah Rossi. She quickly joined the staff as Office Manager and in less than a year became a Project Manager, helping to develop the Giving Project model that has propelled SJF to new growth and success. As a Project Manager, Kylie co-facilitated 14 Giving Projects, supporting over 150 members in building their analysis, developing their skills as donor organizers, and funding social justice movements throughout our region. 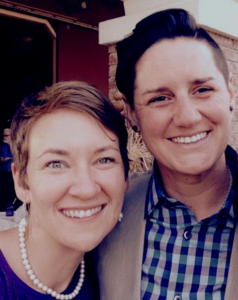 In 2014, Kylie stepped up as Development Director and has spent the last year deepening relationships with our donors, establishing new systems, and organizing the most successful annual dinner in years. Kylie is moving to Kansas City, MO to be with her partner. Social Justice Fund will miss her intelligence, empathy, curiosity, commitment, and hilarious sense of humor, and we wish her the best in her new adventure! Mary Ann and Kylie will be overlapping until March, so get in touch with either of them over the next month.